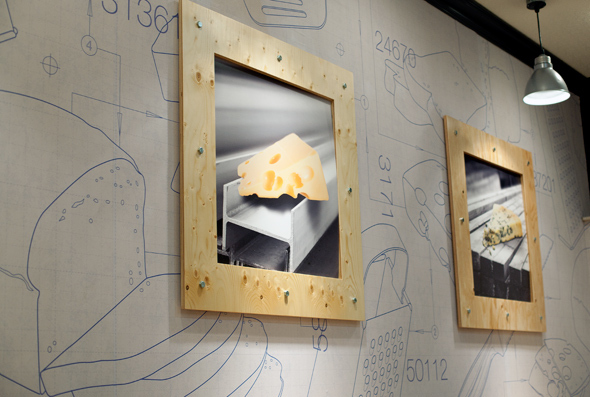 The Construction Site (Grilled Cheese at Work) is a new cafeteria style restaurant located at Yonge and Eglinton. It's a bit tucked into the side of an office building, but if you manage to see the giant waving cheese banners blowing around outside, then you know you're in the right place. My friend is a bit of cheese sandwich connoisseur, if that's possible (she's always upping the gourmet quotient...her grilled cheese sandwiches are stuffed with brie and strawberry jam on challah bread), so I thought who better to bring but a designated "expert". We found the restaurant a bit empty, one of the perks of going at night. 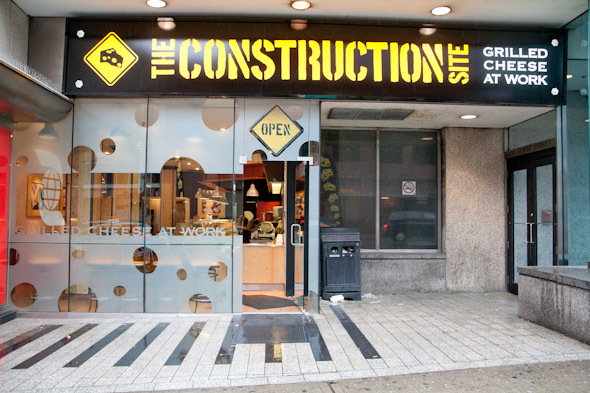 The Construction Site is a bright, well lit space, with a sparkling stainless steel cooking area and enclosed in a glass storefront, affording great views (and single seating) to watch the Yonge street hustle and bustle. Decorated with loads of (literally) cheesy pictures, the main seating area features several long wooden communal tables so be prepared to mix it up with some new pals. After checking out the fresh ingredients, we turned to the menu to make our final selections. I'm a typical Canuck, always up for pork products, so I ordered the All Day Breakfast ($6.50, plus $1.50 for the bacon) which came with thinly sliced aged cheddar cheese sandwiched between slices of white French bread, bacon and a whole egg pressed into the carved out centre (see lead photo). 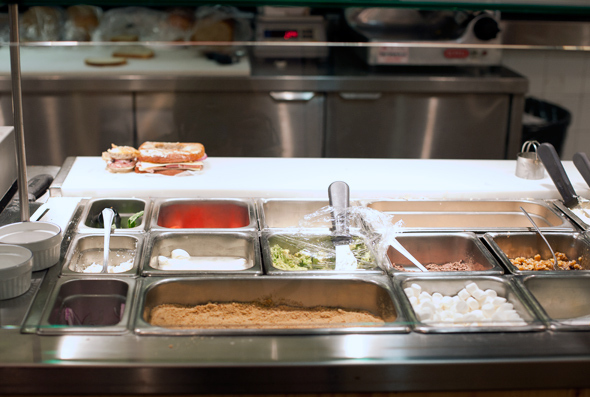 It was a spectacle to watch our order-taker/cook make this sandwich. Let's just say that this place ain't no Subway... Jared would not approve. The butter was liberally spread, the cheese piled on, and well, bacon, I love you, but you didn't help me much. It was a bit on the greasy side, and the egg was a tad over the top for my taste, but it was filling and satisfying. The bread was perfectly crispy, likely due to the very cool contraptions that fry your sandwiches before your eyes — no griddles here. My dining buddy ordered the weekly special, the Cha Cha Cha ($9.50), a somewhat healthier option, with jalapeno Havarti and feta cheeses, smashed avocado (resembling guacamole) and red onions served on ancient grain sourdough. After snagging a bite I was on the fence. Who's sandwich was tastier? Hers was creamier, and I liked the spicy kick from the red onions. The avocados gave some weight to the smooth texture and the bread was grainy, hearty and just the right thickness to contain the middle. 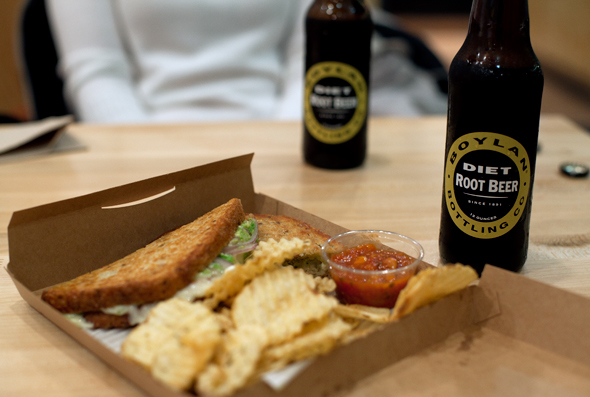 Each sandwich comes with side chutney or ketchup and some in house made ruffle chips that are warmed under the heat lamp. Scented with rosemary, the lightly salted chips were a crunchy accompaniment, but just a little bland. I'm a more-is more type gal, give me the salt shaker and bottle of malt vinegar and then stand back! After finishing our sandwiches, we debated on ordering the S'more dessert $7.50, but couldn't find the room. 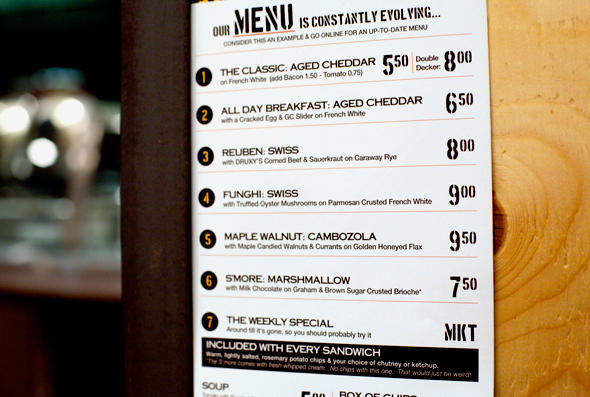 The prices are bit steep for sandwiches, but it is a nice change from the other submarine sandwich places.